I am not one to make much of a fuss for Valentine’s Day. The whole Holiday kind of got ruined for me in High School. Every year some organization would be selling flowers to deliver at homeroom and every year, despite having a boyfriend three out of four years on Valentine’s Day, I would get nothing, while some girls would get tons of flowers. And while I am married to a man I love more than my I-Phone, we still don’t make a big fuss about Valentine’s Day. There will be cards and maybe some chocolate, but nothing extravagant. Most guys claim to not care about Valentine’s Day. Or say that you should show love all year round, or that it is a commercial day designed by Hallmark, Godiva and 1-800-Flowers to part a man from his money. And honestly most women feel the same way. Valentine’s Day means that its hard to get into a restaurant, and that they are most likely to get underwear that may require a manual to get into. However, for women there is a competitive spirit to the Holiday that harks back to those High School Flower sales. Now instead of watching the popular girl in homeroom get tons of carnations you watch the flower parade go by at work. 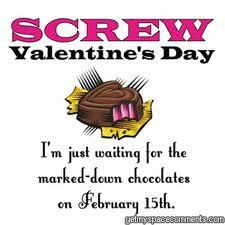 And whether you are single, dating, or married you spend Valentine’s Day either trying to one up the other people at work, or swearing that you don’t care about the Holiday. Either way you find yourself mildly annoyed by the day, and looking forward to the 15th. I know I am.